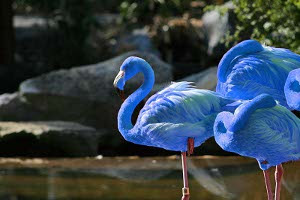 Name: South American Blue Flamingo, blue flamingo, and aenean phoenicopteri is it's Latin name. Appearance/Anatomy: The blue flamingo measures 49", and with a small, blue, feathered body, yellow eyes, long, thin legs, it is rather easy to recognize the bird. Diet & Habitat: The blue flamingo lives on the Isla Pinzon archipelago, and eats the bluefish and shrimp that surround it's habitat. Adaptations & Behaviour: The blue flamingo does not cooperate well at all with the American Flamingo, as it screeches and pecks violently when it sees a pink flamingo. This is most likely due to the fact that the South American Blue Flamingo sees the American Flamingo as a threat; as an opponent. Enemies & Protective Behaviour: The blue flamingo's main enemy is an endangered species. It is the Tip-tailed cougar, a red-green colour-blind animal, has preyed upon the birds. The blue flamingos can do nothing but run. They can run up to 12mph. Special Features: The blue flamingo can change his eye colour. When a flamingo has black eyes, it is feeling neutral. When happy, it's eyes turn yellow, when angry or sad, it's eyes turn red, and when scared, it's eyes turn white. The flamingos use this to communicate with foreign species such as humans, predators, etc. Offspring: Blue Flamingo chicks greatly resemble the offspring of American Flamingos. Their soft, fluffy feathers are white with a tint of blue, and their legs tend to be slightly longer and thicker than those of the American Flamingo chicks. However, the Blue Flamingo chicks' eyes are black until they reach adulthood. These birds are bathing in the sun. How would you describe this blog? Blog updated April 2014. Picture Window theme. Theme images by lucato. Powered by Blogger.